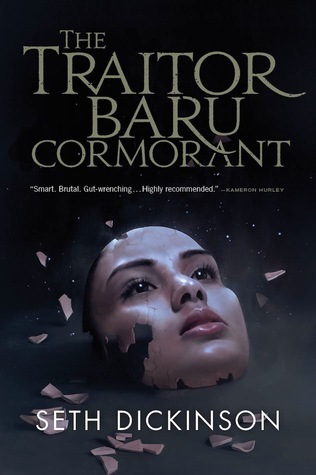 The Traitor Baru Cormorant is a technically superb and compulsively readable novel that might also be the most frustrating thing I’ve read this year. It’s a book that comes very close to greatness only to fail so slightly, yet so completely, that it’s actually pretty impressive. The story opens with the invasion of the child Baru Cormorant’s small island nation by the militarily, culturally, and economically hegemonic Empire of Masks. Baru’s entire life is disrupted by this momentous event, and she sets out on a lifelong quest to infiltrate the Empire itself, understand its workings, and find a way to avenge the wrongs that were done to her family and her people. It’s a fascinating story from the very beginning, and Baru is an incredible character. I have a penchant for unlikable women in fiction, and Baru is, frankly, pretty despicable by the end of this book. She’s inscrutable and calculating. She’s cold and selfish and manipulative and arrogant. She gives words like duplicitous and treacherous new meaning. Baru Cormorant will do anything, say anything, sacrifice anything–or anyone–in pursuit of her long term goals. I love her, of course. The enormous cast of supporting characters is equally well-drawn and works to bring the world to life. Every character works, from Baru’s three parents to the mysterious “benefactor” who sponsors Baru’s education and career to the woman Baru loves. Like every other detail of The Traitor, each and every character seems meticulously planned, and they all move around and through Baru Cormorant’s life like clockwork. The Empire of Masks (or Masquerade) looms large over all of the characters we meet, as they are all either colonizers or colonized (and sometimes both). The Traitor is a pretty amazing portrait of the dynamics and complexities of colonization, and the Masquerade touches every aspect of people’s lives. In addition to language and currency, the Empire of Masks imposes law and order, educational standards, religion, strict “hygienic” practices (namely, no homosexual or polyamorous relationships), and eugenic breeding schemes. Like all empires, the Masquerade is a mix of good and bad; it’s not devoid of benefits for some of the people it colonizes, but it definitely brings its changes whether the colonized like it or not. It’s interesting to see an author making such an honest attempt at really deeply examining how that colonization works and what it does to people. Which brings me to one of the two subtle-but-significant failures of The Traitor Baru Cormorant. While the novel tries to handle its themes with delicacy and nuance, and is helped along in this by staying strictly in Baru’s point of view, I can’t help but feel that in the end it’s all treated a bit glibly. The evil empire itself is almost too evil to be really believable, and the book makes far too much of a point to highlight the benefits of colonization. Even the choice to center the narrative so firmly on Baru’s POV weakens the message, as Baru’s identity becomes increasingly confused over the course of the novel as she slips further and further inside the mask she’s chosen to inhabit. Her real opinions become more and more opaque as the story goes on, and her perspective becomes unreliable and even slightly unhinged. While the specifics of the ending are well-thought-out and make complete sense, the broad strokes of the ending are so heavily telegraphed in the last 30-40% of the book that the “shocking twist” is more likely to elicit groans than gasps. It’s really obvious, honestly, that this was always the story that was being told and things were always going to play out this way. Unfortunately, it’s just not that satisfying. Perhaps I’m just old-fashioned, but I’m just not sure I “get” this book. I kind of love that Seth Dickinson has done something ostensibly new and different, but how different can it really be if I saw the ending coming so many miles away? Baru Cormorant is an amazing character, but it’s hard to really make a story work when its subject doesn’t, ultimately, get to be even an antihero. By the end of the book, Baru has lost sight of any noble goals she may have had and abandoned every principle she may have started with, so the final impression I was left with was one of existential bleakness and hopelessness so complete that it was actually a little depressing. The Traitor Baru Cormorant is the most fun I’ve ever had reading a book this hyper-tragic, which is something special in itself, but it’s definitely not the sort of thing I want to reread over and over again. It’s funny and smart and cleverly plotted and often insightful, but it also might crush you under an enormous weight of despair. It’s a book that I want to love wholeheartedly, but that ended up leaving me cold. Woah, thanks for the warning. I’m 100 pages from the end and bored to tears. Maybe I should stop now.